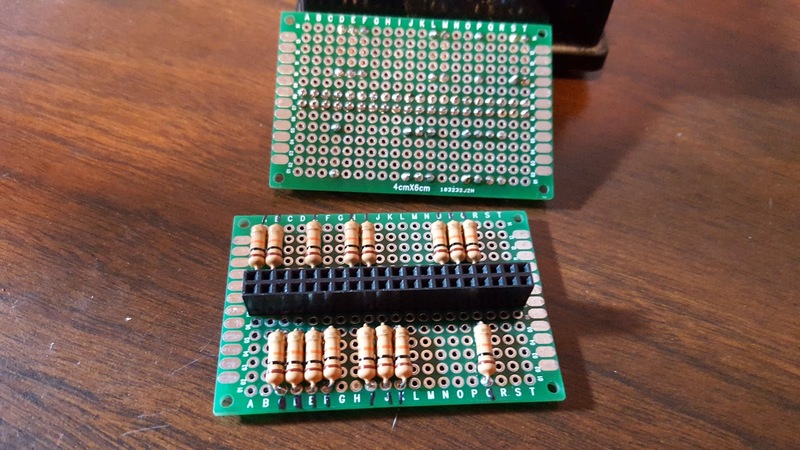 The board with the neat resistors was copied twice. Since two usable boards had already been produced only two more were needed for a four-octave piano. 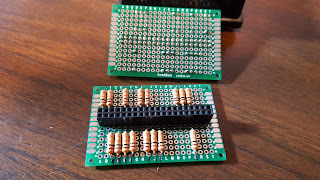 Resistors were attached in the same pattern as the master board by simply making a note of which column needed a resistor and placing one. Each board was populated this way in a short period. 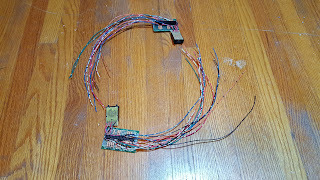 Once the resistors were in place, two sets of wire were cut and soldered in place. When the wires were in place a short piece of wire linked the solder pad with the wire to the solder pads with the header plug and the resistor. Creating the boards was actually a time-consuming process and rather tedious. Each board represented nearly an hour of work, none of which was very exciting. It actually took two days to get through everything. The rest of the posts for this project have been arranged by date. Completed projects from year 1. Completed projects from year 2. 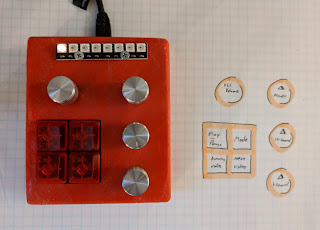 Completed projects from year 3. This disclaimer must be intact and whole. This disclaimer must be included if a project is distributed. All information in this blog, or linked by this blog, are not to be taken as advice or solicitation. Anyone attempting to replicate, in whole or in part, is responsible for the outcome and procedure. Any loss of functionality, money, property or similar, is the responsibility of those involved in the replication. All digital communication regarding the email address 24hourengineer@gmail.com becomes the intellectual property of Brian McEvoy. Any information contained within these messages may be distributed or retained at the discretion of Brian McEvoy. Any email sent to this address, or any email account owned by Brian McEvoy, cannot be used to claim property or assets. Comments to the blog may be utilized or erased at the discretion of the owner. No one posting may claim property or assets based on a post. This blog, including pictures and text, is copyright to Brian McEvoy. I've taken advertisements off the site in favor of a PayPal donation link. Any money sent will go right back into making projects and posting about them. More and more uses for the OpenVectorKB have been found and programmed. It seemed like a neat idea for help while programming in OpenSCAD. Then, it seemed logical to program it to act like a mouse. While it I was at it, why not arrow keys (the most all-around helpful). Recently, I wanted to add compatibility to VLC. VLC media player has a few ways to skip around in the video timeline. It’s possible to click on the timeline with the pointer and it will jump to that point. Pressing Ctrl+T in the Windows edition allows numeric entry for the desired time. The commands of interest for the OpenVectorKB were the arrow keys combined with modifier keys. Ctrl+→ or Ctrl+← will move the video forward or back one minute. Alt+→ or Alt+← will move the video forward or back ten seconds. Shift+→ or Shift+← will move the video forward or back three seconds. 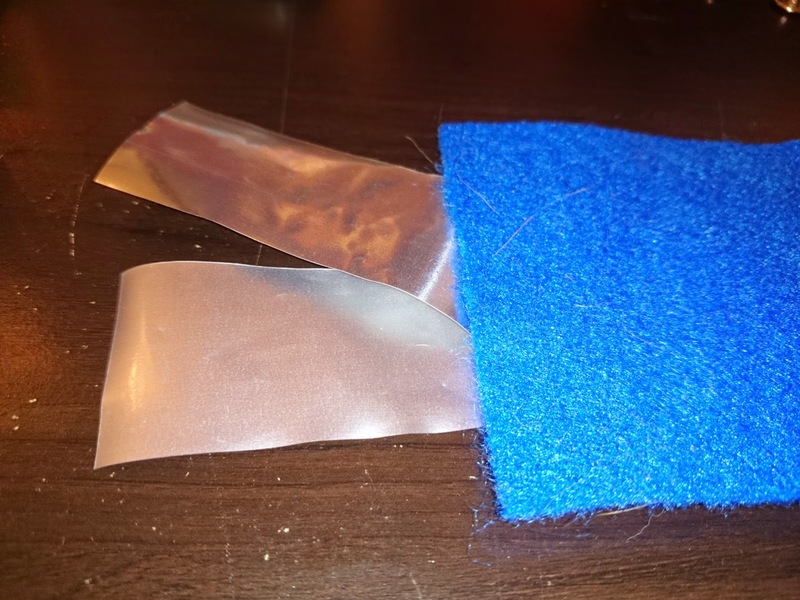 Blue felt and a metal laminated static bag were selected to be combined for making electrodes. The metal laminated material was selected since it can distribute a charger over a large area while maintaining flexibility. Any conductive material could be used in its place including carbon fiber, metal window screen, or sheet metal. Two pieces of felt were cut out at approximately 45mm x 30mm. Pieces of the metal laminate were cut to match the felt. 12mm clothing snaps were purchased to act as connectors. The stud sides of the snaps were placed between the metal laminate and felt pieces then the socket side of the snap was pressed into place. The stud and socket created a shearing action which put a hole throughout the laminate. If metal was being used as the conductive layer then solder or riveting could be used.